WASHINGTON (CNN) - Barack and Michelle Obama re-emerged on the public stage Monday in Washington, only this time for an event that has nothing to do with politics. The former first couple's official portraits were unveiled at the Smithsonian's National Portrait Gallery, a rite of passage for most former presidents, all of whom have their portraits hanging in the museum. Obama welcomed Trump to Washington a year ago. They haven't spoken since. These are perhaps the most anticipated presidential portrait unveilings to date, due in large part to the artists the Obamas selected. The former president chose Kehinde Wiley, a Yale University-trained painter famous for his depiction of African-Americans posed in the style of Old Master paintings, regal, formal and filled with pops of color. "How about that? That's pretty sharp," the 44th president said as he took the podium. The portrait depicts him sitting against a backdrop of green foliage. Obama said he tried to negotiate with Wiley about his look for the painting. "I tried to negotiate less gray hair, and Kehinde's artistic integrity would not allow him to do what I asked. I tried to negotiate smaller ears, struck out on that as well," joked Obama from the podium during his remarks. Obama also asked Wiley, who often depicts his subjects as regal and god-like, if the could ease up on those flourishes. "I had to explain that I've got enough political problems without you making me look like Napoleon. We've got to bring it down just a touch. And that's what he did," the former president said. 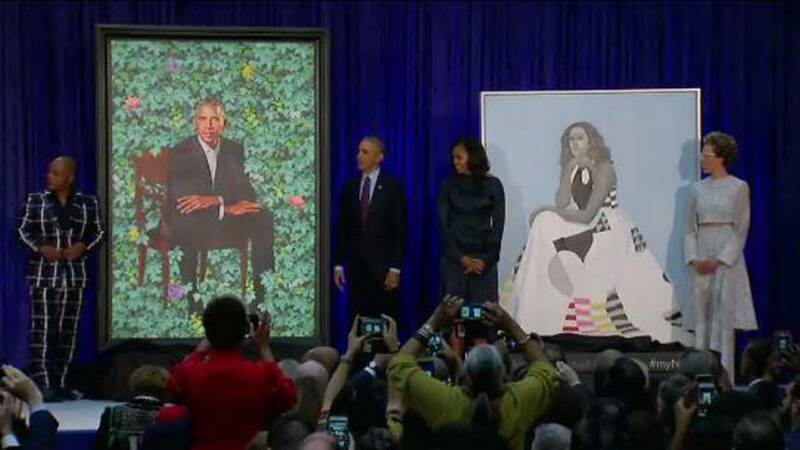 Barack Obama's choice of Wiley makes him the first African-American artist to execute an official presidential portrait for the National Portrait Gallery. "What I was always struck by when I saw his portraits was the degree to which they challenged our ideas of power and privilege," Obama said. The juxtaposition of contemporary urban culture with centuries-old postures and wallpaper-like backgrounds make for bold paintings, of which Obama's is Wiley's most famous to date. Wiley apparently took thousands of photographs of Obama in order to create the portrait, a process different than the typical "sittings" required for most portraits. Wiley's background choice was also indicative of Obama's background. Wiley said he was "charting his path on Earth." The different flowers woven into the greenery include the chyrsanthemum, the official flower of Chicago, and jasmine for Hawaii, there's even some African blue lilies, symbolic of Obama's heritage. Obama also pointed out his personal connection to Wiley -- both men shared similar familial experiences that shaped their futures. "What we did find was that we had certain things in common. Both of us had American mothers who raised us with extraordinary love and support. Both of us had African fathers who had been absent from our lives, and in some ways our journeys involved searching for them, and what that meant. I ended up writing about that journey and channeling it into the work that I did because I cannot paint," he said. Michelle Obama said she "was a little overwhelmed, to say the least," after her portrait was unveiled. "Let's just start by saying, 'Wow,' again," she said. Pointing to her mother, seated in the audience, she added: "Hi Mom. Whatcha' think? Pretty nice, isn't it?" For her portrait, Michelle Obama chose Baltimore-based artist Amy Sherald. Sherald is another African-American artist known for her unique style, and her portraits also tend to underscore themes of social justice. She often paints black skin tones in gray as a way to take away the assigned "color" of her subjects. Sherald's work is less about realism in composition and more about shape and color; like Wiley, the choice of Sherald ushers in a new era of presidential portrait. "Amy, I want to thank you for so spectacularly capturing the grace and beauty and intelligence and charm and hotness of the woman I love," the former President said of his wife. Sherald's painting of Michelle Obama shows her in a flowing, patterned dress with a halter neckline; her expression is thoughtful, her chin resting on her hand. The former first lady said she was thinking about the impact Sherald's work will have on "girls and girls of color." "They will see an image of someone who looks like them hanging on the walls of this great American institution ... And I know the kind of impact that will have on their lives because I was one of those girls," she said. The Obamas looked at the portfolios of more than two dozen artists before deciding on Wiley and Sherald. Obama's portrait will hang in the hall of presidents and the former first lady's will be placed in another gallery. Both will be open to public viewing on Tuesday.